The Interactive HTML Profiler output is new to the latest version of JMP. It is meant to replace and improve upon the interactive output provided by the Flash (SWF) export facility in previous versions of JMP, one major advantage being that the HTML5 technology used is supported on mobile devices such as the iPad whereas Flash is not. If you are unfamiliar with the Profiler platform, here's what you need to know: It enables you to explore cross sections of predicted responses across multiple factors. 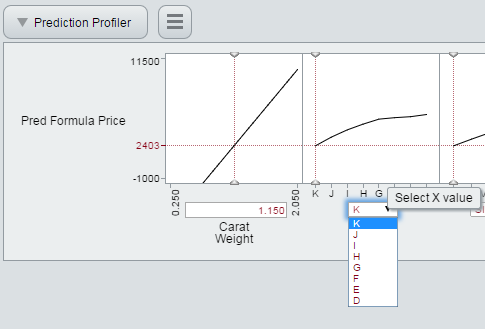 The Profiler guide in JMP documentation provides further details on how to use this platform. Interactive HTML is a feature we introduced in JMP 11, and it is supported on most modern browsers. For more information on Interactive HTML export capabilities in general see Save the Report as Interactive HTML. Give it a try yourself! Export an Interactive HTML Profiler and open it in a web browser. You'll see that you can hover your mouse over the reference lines or the curves themselves on the desktop in order to display tooltips that show the values at that point while in identification mode (see Heman Robinson's recent post for a description of the mobile interface and the different modes). This example was prepared using the Diamonds Data.jmp sample data set. 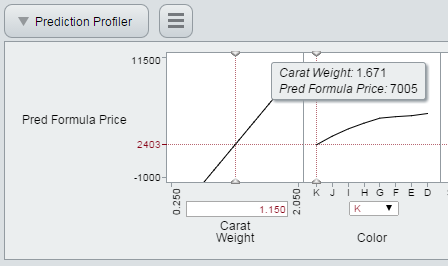 An Interactive HTML Profiler displaying a tooltip for the curve Pred Formula Price for the continuous factor Carat Weight. Interacting with a curve of the Interactive HTML Profiler sets its reference variable and updates all related profile curves. Clicking anywhere within the graph (or touching on a mobile device) moves the reference variable to that value, or you can click and drag a reference line to update the curves. The Profiler behaves a little differently than other Interactive HTML plots in that it has dragging of the reference lines in both identification and brushing modes. Alternatively, you can click on either the edit box for continuous variables or dropdown box for categorical variables below the chart to manually edit. This allows you to enter a precise value, or for continuous variables, to explore the curve outside of the currently displayed range of values. For mobile devices, this method of entry is particularly useful since a precise value is harder to achieve with a finger compared to a mouse. Selecting a value for a categorical factor from the dropdown control. In addition to these two types of data, the Interactive HTML Profiler can handle simple mixture constraints from JMP, just as Flash could. When this type of data is present, additional controls are present to lock and unlock a constrained variable. 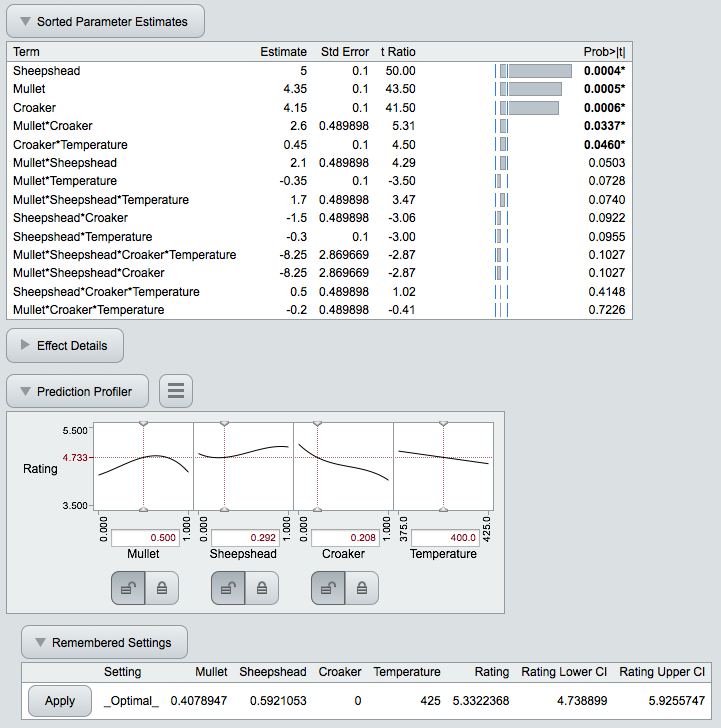 The following Profiler using the Plasticizer.jmp sample data has a mixture constraint that the three factors must sum to 1. Mixture constraint profiler showing unlock/lock factor toggle controls. The unlock/lock toggle button pairs allow you to lock a factor in this mixture at its current value so that when changing the other factors it does not change. For example, if you were to click the lock button below the factor p1, the reference line becomes a solid red line and the lock button is toggled down to indicate this factor is locked. Note how the range of the curves for p2 and p3 become restricted further since p1 is locked at 0.6615 -- but all three must still sum to 1 (see the figure below). By clicking the lock button, the factor is toggled to the locked state. You can still click and drag p1, but the other factors will be constrained with p1 fixed at the new value. Resetting a Profiler is a useful way to get back to the initial state without refreshing the entire webpage. Interactive HTML Profilers cover the same features as the Flash version (which is still present in JMP 12). In addition to using HTML5, which makes these Profilers available on mobile devices, we included a few new features that weren’t present in Flash. A mobile accessible interactive report requires a mobile friendly user interface, and Interactive HTML reports were designed in JMP 12 for ease of use on tablets and phones. See Using JMP 12 Interactive HTML reports on mobile devices for more details on how these reports work on mobile. While Flash allowed you to export only the Profiler Platform, Interactive HTML also allows you to export a Fit Model Least Squares report with an interactive Profiler alongside the other interactive tables and charts. The Fit Model picture displayed above also shows exported remembered settings, another new feature in the Interactive HTML Profiler. While preparing a Profiler in JMP, if you find a combination of factors that is interesting, you can use the Remember Settings feature under Factor Settings in JMP to save them to a table below the Profiler. In the exported Interactive HTML, these values can be applied to your Profiler by clicking the Apply button to the left of the row of values as seen in the picture below. Fit Model results for a famous mixture experiment. The Profiler provides a wealth of information about your model. And in JMP 12, exporting to Interactive HTML lets you communicate with colleagues who don’t have JMP yet. The best way to get familiar with this exciting new platform on the web is to try a few examples: JMP 12 Profiler Examples. The pictures in this blog post are available there as live Interactive HTML files to explore, as well as a few other examples.